Cryptocurrencies have bounced back harder than ever with Bitcoin (BTC) gains driving most of the momentum. BTC is currently* trading at $2800.25 which is a 5.45% increase in the past 24hrs. As we already know, and for those who did not know before, most alt coins follow the momentum Bitcoin creates. However there have been significant double digit figures in some coins such as Antshares, Stratis, Steem and many others. The well known scaling issues of bitcoin and the potential for a blockchain split were among the factors that traders were afraid of. This created major volatility in the market, and while the price was falling, more were adopting the “this is the end” mentality. However, this changed from July 16th when BIP-91 had locked in creating more certainty in bitcoin’s future. BIP-91 can be looked at as the ‘prologue’ to the activation of Segwit2x. It is compatible with UASF and has basically provided a clearer path to Segwit2x, which means no more of this talk of a chain split. 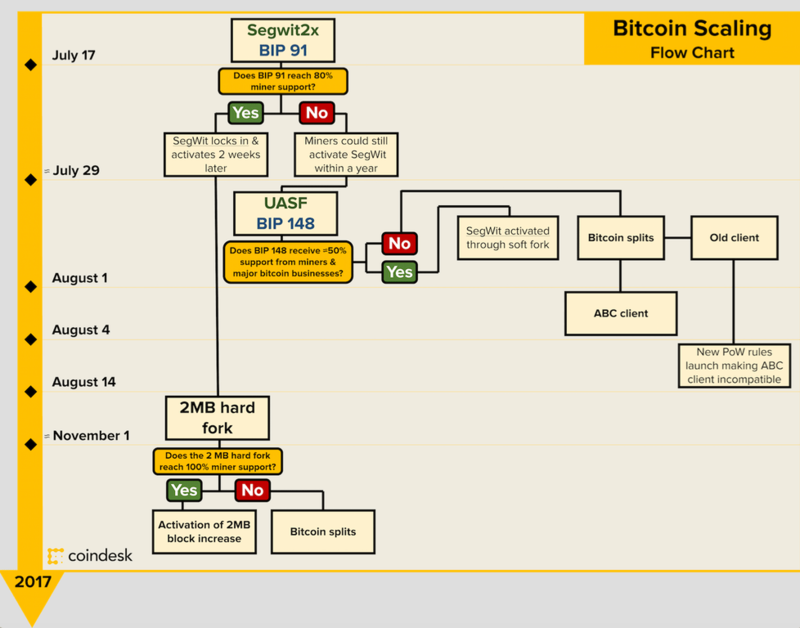 Before we can go further, we must address the path that bitcoin still has to go through in order to activate Segwit2x. According to CoinDesk, there is first a 336-block “grace period” which takes around two and half days for miners to prepare for the activation. From there, BIP 91 will activate at block 477,120. In other words the mining pools will reject any nodes that do not show SegWit (BIP 141) readiness. This step is important as it allows mining pools to either reap rewards or incur losses while still coordinating this upgrade in the blockchain. Afterwards “SegWit could lock-in during the next difficulty adjustment period of 2016 blocks, which takes about two weeks”. One major concern to many that believe this potentially could not succeed, is if bitcoin users have trust with each other and that all sides will be running the software needed to run SegWit. So, in other words, while it may seem we are in the clear with major problems, we are still not “out of the woods”. The market cap for crypto currency has just reached $97.5 billion, only creeping closer towards that $100 billion marker with bitcoin currently holding 47.3% of the total capital. Once reaching this marker investors believe we will begin to see new ATHs reached within the crypto world and especially its gold standard BTC. Goldman Sachs chart analyst, Sheba Jafari, predicted that the bitcoin price would reach around $3212 as a minimum and could go as high as $3915. With the most recent change in the bitcoin market and psychology around investors going positive, the claim that bitcoin could reach $4000 does not seem highly unlikely. Those in 2016 who claimed bitcoin would reach $3000 after it finally reached $1000 on the year itself were almost ridiculed until May-June when the markets exploded. However, the one thing we cannot predict is the future. The world does not know for sure if this means upward growth from here on out. *At the time this was written.